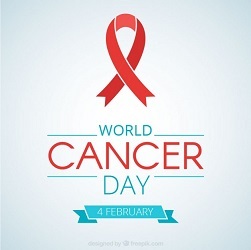 The 4th of February has been designated as World Cancer Day. Cancer is a term used for diseases in which abnormal cells divide without control and can invade other tissues. Cancer cells can spread to other parts of the body through the blood and lymph systems. Cancer is not just one disease, but many diseases, which require different treatments. However prevention strategies are often common to many, if not all cancers. A person’s cancer risk can be reduced with healthy choices like avoiding tobacco, limiting alcohol use, protecting your skin from the sun and avoiding indoor tanning, eating a diet rich in fruits and vegetables, keeping a healthy weight, and being physically active. It is thought that about 40-50% could be prevented by practicing healthy living. Many cancers however are triggered when dividing cells make errors leading to out of control growth. Thus knowing early symptoms and following screening recommendations are helpful in finding cancer early which is more amenable to treatment. The number of new cancer cases can be reduced and many cancer deaths can be prevented. Research shows that screening for cervical and colorectal cancers as recommended helps prevent these diseases by finding precancerous lesions so they can be treated before they become cancerous. Screening for cervical, colorectal, and breast cancers also helps find these diseases at an early stage, when treatment works best. Vaccines can also prevent cancer. The human papillomavirus (HPV) vaccine helps prevent most cervical cancers as well as many throat cancers, and the hepatitis B vaccine can help lower liver cancer risk. It is important to note that Kentucky is one of the unhealthiest states in our nation; but, a few healthy lifestyle choices could change this. First, eating normally proportioned helpings of nutritious foods including at least five fruits and vegetables a day can lower weight and reduce heart disease and diabetes. Second, exercising about 30 minutes per day can lower blood pressure. Third, avoiding the use of tobacco products can reduce several types of cancer. Finally, making sure you get your needed preventive screenings can detect diseases early and greatly increase your chances for a positive health outcomes, while receiving your recommended vaccinations can prevent acquiring disease in the first place. Don’t forget to visit our website at www.LCDHD.org and fill out your wellness profile for a chance to win $1,000.00.